Roofline is proud of its excellent record in all aspects of the construction process, from design and value engineering through to health and safety, professionalism on site and project completion. Roofline have an experienced and professional management team and a highly skilled workforce who, combined, have an impeccable record of consistently delivering projects to a high standard. STEM – Funded by the European Union Development Fund and Kent County Council, STEM (Steps to Environmental Management) is a guide to maintaining an environmental management system within a business. As part of our continued action to create a more sustainable future we have been awarded STEM Certification through an assessment of our Environmental programme, including the measurement of our carbon footprint and the actions we have taken to reduce it. Best Trading Partner – A leading industry analysis placed the Roofline Group in the top 1% of our industry for efficiency and growth. In addition we were listed in the top 10 for ‘Best trading partner’. 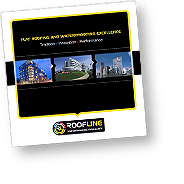 As an independent Flat Roofing and Waterproofing specialist, Roofline group are one of the largest organisations of their kind in the UK today and directly employ one of the highest number of specialist tradesmen in the industry. Achilles – The Roofline Group are proud to announce that following the completion of an extensive Pre Qualification Questionnaire and a detailed two day audit process of all company policies and procedures the group have achieved a Top tier level 5 rating. The Achilles Building Confidence Scheme is recognised as one of the main standards for supplier excellence within the construction industry. Supply Chain Sustainability School – The Roofline Group are proud to hold Gold accreditation within the Supply Chain Sustainability School. The School represents a common approach to developing sustainability competence in the supply chain. Roofline have been members of the school since its launch and have continued to develop the sustainability aspect of their business. CITB – Roofline fully support personal development and promote teamwork and the continuous improvement of skills and knowledge to raise the standards in our Industry. 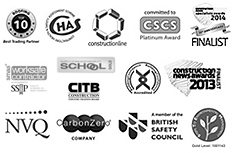 In association with the CITB, Roofline have put almost every team supervisor though SSSTS certification and every site based or mobile project manager through SMSTS certification. In addition, every employee Director level to Apprentice holds CSCS certification. co2balance – At the heart of our environmental initiatives, Roofline are a Carbon Zero company. In association with C02 balance, Roofline actively work to reduce their emissions and offset their remaining carbon footprint, including all fleet vehicle emissions, power and utilities. This initiative allows Roofline to deliver Carbon Zero installations. The carbon offset is achieved through investment in approved and verified emission reduction programmes that deliver clean technology. Constructionline – Constructionline is the UK’s largest register for Pre-qualified contractors In terms of efficiency, time and cost saving and best practice, constructionline brings specialist contractors such as Roofline to the forefront for selection by public and private sector organisations. Constructionline approval plays a vital role in improving and simplifying the PQQ process. Roofline Group are fully approved on the Constructionline contractor register. CSCS – Roofline group are proud to hold Platinum certification for the Construction skills certification scheme. 100% of our tradesmen and site management hold CSCS cards and we fully support this scheme to improve quality, reduce accidents and prove occupational competence. NVQ – National Vocational Qualifications – NVQs are work-related, competence-based qualifications. They reflect the skills and knowledge needed to do a job effectively, and show that a candidate is competent in the area of work the NVQ framework represents. Roofline has three NVQ qualified assessors in house and continued training and development of our staff is a Major contributor to the successful execution of our work and in ensuring future development and growth. Contractors Health and Safety Assessment Scheme – CHAS is available for use by any public and private sector organizations to use when short listing contractors, suppliers and consultants (companies) who apply to work for them. It provides information about the health and safety part of their application and confirms they meet acceptable standards of health and safety compliance. Roofline hold full accreditation under the CHAS assessment scheme. SMAS Accreditation – Safety Management Advisory Services (SMAS) are a Health & Safety organisation that employs qualified Health & Safety professionals to ensure businesses are complying with the core criteria as set out by the SSIP partners.